This delicious Portuguese recipe is brought to you by our Featured Foodies, A Couple in the Kitchen! 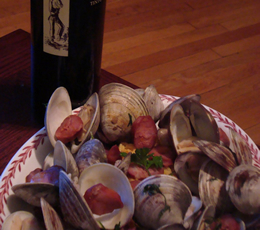 Our friend Becky in WA was looking for a clam recipe, and we thought this would be a good one to try. If the linguica is not for you, this recipe holds up without it. Put linguica, clams, garlic and cilantro into a large pot. Pour in white wine and water and then add salt. Put the lid on and cook over high heat so that the clams steam open. Serve over rice and with a good Portuguese wine to enjoy a simple, traditional Portuguese meal.